What is there to do in Harrison? With its marina, public beach, and world class cycle trail, the picturesque city of Harrison, Idaho, is the perfect getaway for family and friends on the south end of Lake Coeur d'Alene. Enjoy outdoor dining overlooking the lake, local wine tasting, historic museum, ice cream shop, shady park, and shopping, all within an easy walk of the lake and trail. People who visit Harrison come back again and again. Harrison has public docks, a boat launch, lakeside campground, sandy beach, and relaxing friendly atmosphere. 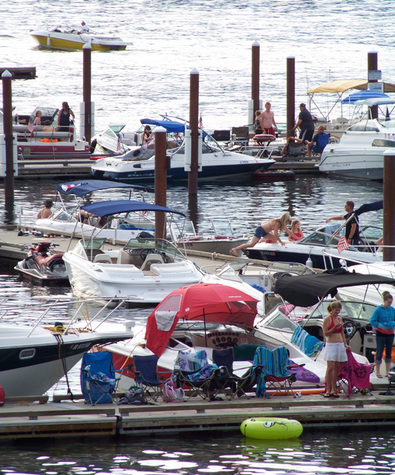 Many people arrive by boat and take advantage of free moorage at the docks (48 hr. limit). No boat? No problem. Harrison has two family-owned watercraft rental businesses to serve you. ﻿Rent boats and vacation homes from Harrison Pontoons & Rentals, or ﻿boats, kayaks, water toys, and Stand Up Paddle boards from HI Water Adventures, Inc.
Harrison is a popular base for cyclists riding the 72-mile Trail of the Coeur d'Alenes, a paved rail-trail that stretches across the Idaho Panhandle. Cycle, hike, or roller blade along the lake over the sweeping Chatcolet Bridge seven miles south, to historic Heyburn State Park, where you can spend the day swimming in the lake and hiking on forested trails. The folks at Harrison Trading Post will outfit you with drinks, deli salads, snacks, and sandwiches on house-made bread for the trip. Riding the trail is free! Start planning your trip by downloading some trail maps. Rent cycles at The Cycle Haus (formerly Pedal Pushers). It's officially a city, but historic Harrison has the atmosphere of a quaint village. It's been a favorite destination for Inland Northwest visitors since the early 1900s. Drivers and cyclists like to spend the night at one of three lodgings downtown, or camp right on the water. For a short cycle trip, get off the main trail and check out Thompson Lake Wildlife Refuge on the edge of town to spot and photograph osprey, eagles, white swans, and other wildlife. 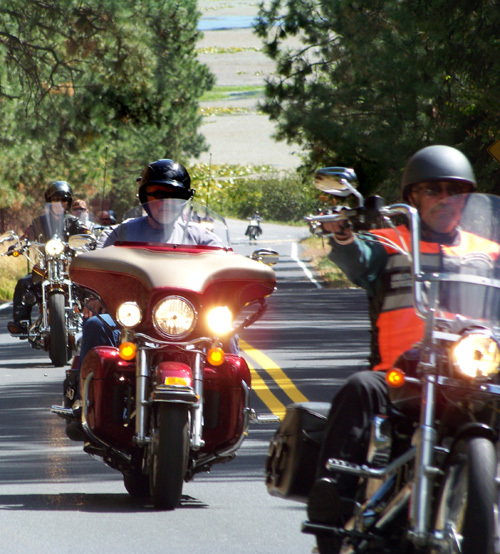 The winding scenic byway is a favorite for motoryclists and folks out for a relaxing drive along beautiful Lake Coeur d'Alene. 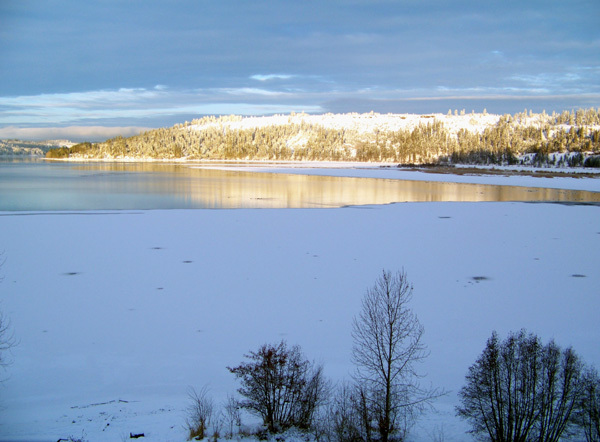 Harrison is 28 miles (45 km) south of Interstate 90 on the Lake Coeur d'Alene Scenic Byway, (Hwy. 97). Take the Wolf Lodge/Harrison exit, # 22 and head south to Harrison. Public Restrooms are in northeast corner of the city park. They are open seasonally. The vault toilet at the Trail of the Coeur d'Alenes trailhead across from the public beach is open year round. The vault toilet is handicap accessible. Look for the ADA parking space at the trailhead right next to the trail. Cell Phones that operate on Verizon towers work in Harrison. ATT customers will have to drive up to the cemetery on Prospect or Harrison Flats for service. One Shot Charlie's restaurant and bar is open daily with lunch and dinner served from 11 a.m. to 8 p.m. (9 p.m. on Saturday). The lounge is open later. If you come on Friday, you will be amazed at all the people that show up for taco night! Harrison Trading Post is a full service grocery store with a selection of coffees, bakery, and deli goods, open 9 a.m. to 6 p.m. in winter. 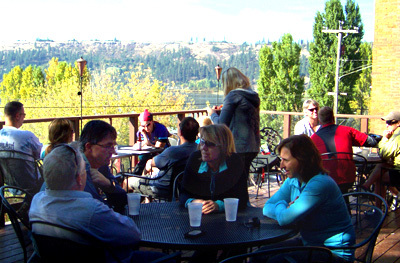 Lakeview Lodge motel and Osprey Inn B&B are open year round. The Company Store specializes in vintage, collectible, upcycled, and architectural salvage. Open by appointment in winter. Call 208-699-2228. WIFI is available at One Shots, the Tin Cup, the lodgings, and the Harrison Library. Gas up before coming to Harrison. It's always a good time for a relaxing getaway to Harrison, Idaho, on the shore of Lake Coeur d'Alene. Come by boat, bike, cycle or car!